Elvira, Mistress of the Dark. Need we say more? Well we might not need to say more, but we're going to anyway. There's the sweeping eyeliner. The blatant double entendre. The valley-girl demeanor. The saucy sarcasm. The plunging neckline. And of course, the hair teased within an inch of its life. If you're looking for the full Elvira effect, please consider this Elvira Costume Wig before you fluff and tease your own hair to these punk-goth proportions. 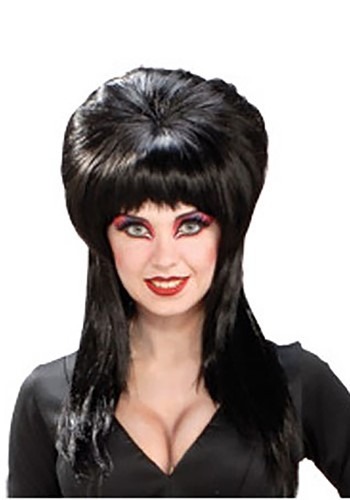 We won't stop you of course, but just know you can achieve immediate volume, silky blackness, and lovely long locks in one fell swoop with this Elvira Costume Wig. We can't vouch for how the rest of the makeup and outfit will turn out, but your hair will make the cut. Isn't it fabulous, darling? This wig is good quality and fit well. A little difficult to detangle, but it worked well with my Elvira costume and wasn't uncomfortable to wear. I have never bought or worn a wig before making my purchase. When I received my wig, it looked just like the picture. The quality of the wig is exceptional. It's a fabulous compliment to my Elvira dress. It's a must-have. It's full & fit perfectly. I'm very pleased with my purchase!